Vegan comfort food to the max. 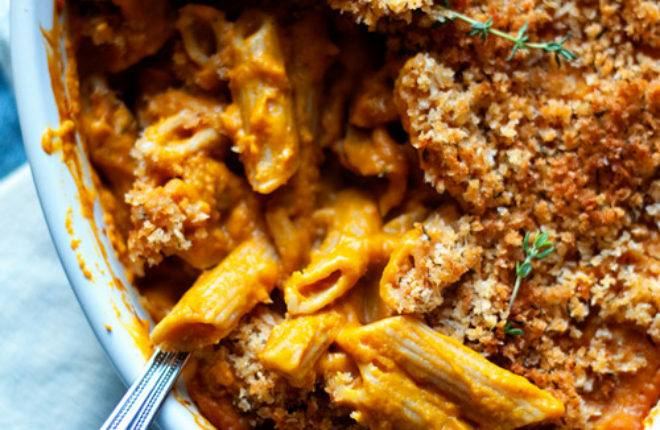 Butternut squash, garlic, smoked paprika … pureed into a velvety sauce that smothers al dente whole wheat penne. But we’re not done yet! Because then it’s poured into a casserole dish, sprinkled with herbed bread crumbs, and baked until bubbly and golden-brown. Okay, now you can dig in! We have an oven! We have an oven! Man, I missed having an oven. It was only three weeks, but it was a long three weeks. Now I can, like, bake real things. You know, such as dinosaur-shaped chicken nuggets for the little one … the first thing we cooked up. Hey, this is real life. But then! 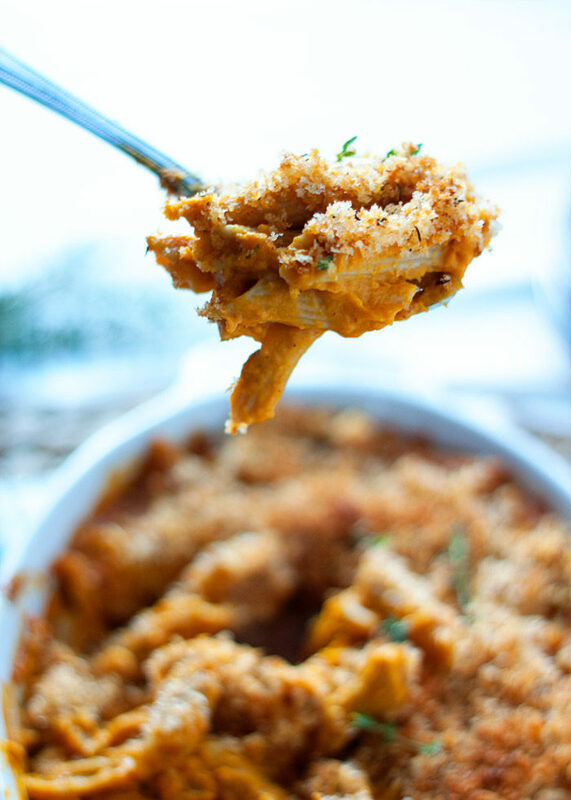 Then I baked this vegan Butternut Pasta Bake. Redeemed? I’d like to think so! 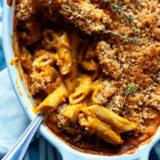 This is basically another vegan mac and “cheese” recipe, in that it’s rich and creamy and has that look about it, and it’s based off of that same recipe. But really, this isn’t about the cheese or anything that tastes like it. 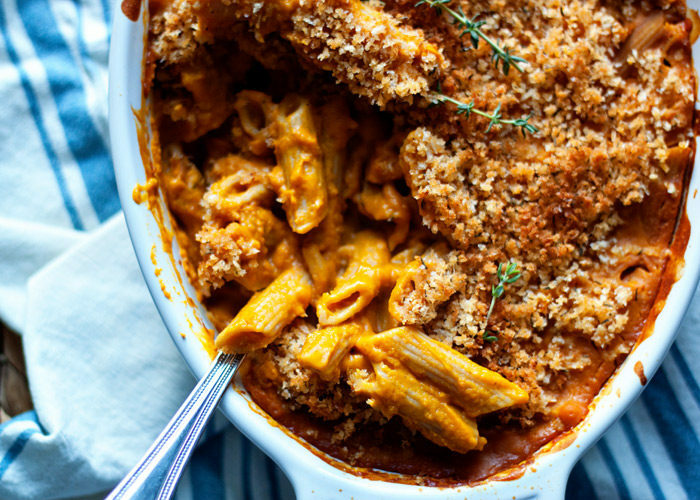 It’s all about the glorious butternut and its ability to transform into a velvety sauce that oozes into every nook and tunnel that the penne pasta throws at it. 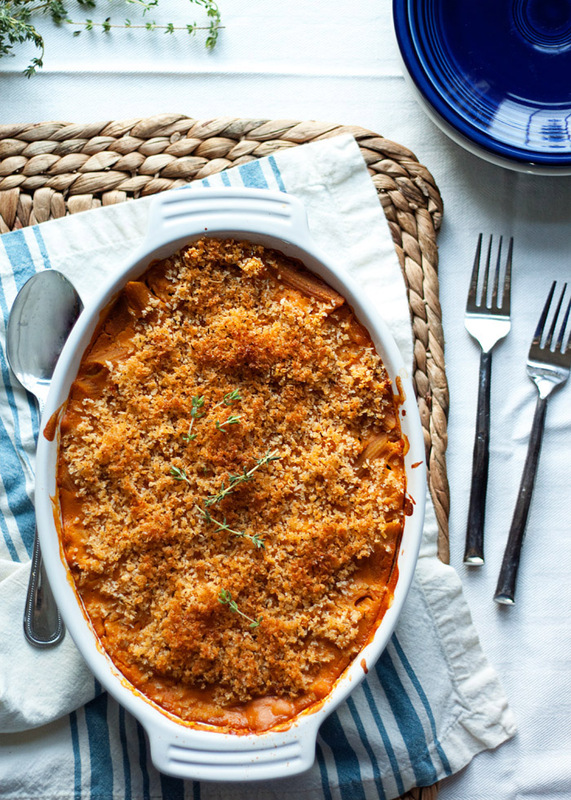 And I guess also like many mac and cheese recipes, this one is topped with glorious breadcrumbs and then baked until bubbly and golden. Except! It’s vegan! No dairy, no cheese. And just to up the healthy factor, I decided to use whole wheat pasta, too. Comfort food, justified. Yeah … the brand spankin’ new oven might just be getting a workout with this one. Well, yeah. And with the dino-nuggets. Bring a large pot of water to a boil. Cook pasta according to package directions, stopping 1 to 2 minutes short of the recommended cooking time so that the pasta is nice and al dente. Drain, return to pot, and set aside. While the pasta is cooking, start the sauce. Set a large saute pan over medium heat. When hot, add the olive oil. Add the onions and saute, stirring occasionally, until soft and turning brown, 7-8 minutes. Add garlic and cook, stirring, for another minute. Add broth, stirring to loosen up the bits of cooked onion at the bottom of the pan. Stir in the dry mustard, smoked paprika, salt, black pepper, and Tamari. Add the butternut squash. Bring to a boil. Reduce to a simmer and cover the pan. Cook until the squash is tender, 7-8 minutes. Remove veggies from heat, remove lid, and let sit until cool enough to handle. Transfer to the pitcher of a blender. Add coconut milk and lemon juice. Puree until smooth. Taste and add additional salt and pepper, if desired. If the sauce is too thick to move around in the blender, thin it with a little more vegetable broth. Pour the butternut sauce over the pasta in the pot. Stir gently to combine. Pour into a 2-quart baking dish (approx. 8-inch by 8-inch should be fine). It will seem seem soupy, but it will thicken up when it bakes! Make the breadcrumb topping. Add Panko breadcrumbs to a small bowl along with the thyme, paprika, and salt. Mix to combine. Drizzle the olive oil over the breadcrumb mix and stir until combined. Spoon over the top of the pasta. Bake at 350 degrees until bubbly and the breadcrumbs are golden brown, about 25 minutes. This looks so hearty and creamy, love it! Perfect winter warmer. Thanks so much for this recipe. All five of my family members (including my 8yo, 5yo food allergic kid and picky 2yo) gobbled this up. That NEVER happens. Thanks so much again! My daughter and I cooked this for dinner tonight. We halved the recipe and added some Nooch to the topping. This is a totally delicious, tasty filling meal. Emergency! Want to make this tonight. But I just noticed the sauce looks red to me… Is there tomato is the sauce or it the paprika to give it color. I have jarred tomato sauce and canned tomatoes at home. I could use either! … That is if there is tomato inside! Hi, I know I’m late but there is no tomato in the sauce – the recipe is correct as written. Hope you liked it! Question, in a pinch could you replace the squash with canned pumpkin if so, any idea how much ? Hmm; well theoretically it should work because they’re both pureed squash! I have not tried it so I can’t say 100% if it will work though. If you try it, please report back! This was delicious! Took me longer than anticipated because my husband accidentally got non-vegan breadcrumbs so I made my own. I also ended up having extra sauce so ended up doubling the pasta amount. Very comforting and perfect for fall. It doesn’t say anything here about what to do with the skin of the squash. Do we peel it first or blend it up? Ah, yes, it should be peeled. I just updated the recipe to clarify. Sorry about that and thank you for asking!